An exciting initiative is underway to create a sustainable social circus project in Yangon. 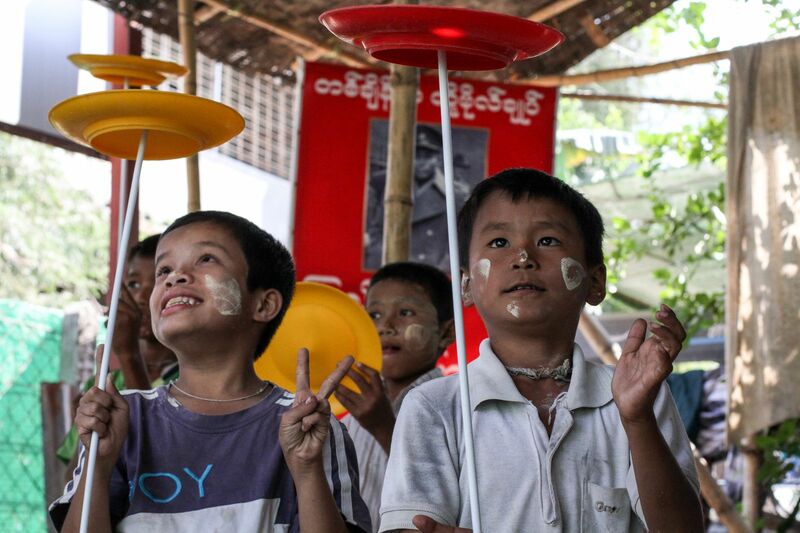 The Serious Fun Committee has launched this initiative following the positive response to the International Juggling Festival which we staged in Yangon in February 2015 in partnership with the Smile Education & Development Foundation. 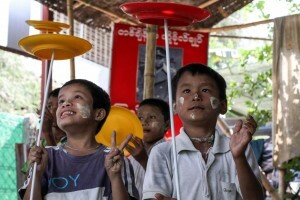 Social Circus Yangon uses circus skills training to engage and empower at-risk youth and people living in marginalized circumstances by improving self-worth, confidence, cooperation, hope and leadership potential. Serious Fun trainer Mr Jules is back in Yangon from December 2015 to March 2016 to train the children’s juggling teams and work with new groups, as well as build the skills of local trainers in order to increase capacity for a sustainable locally-led social circus organization. Jules is helping Serious Fun volunteer Julien Ariza with training for Circus4All which was created by participants in our 2015 training of trainers week with adaptive circus specialist Thomas Hinz for people working with children and adults living with a disability. 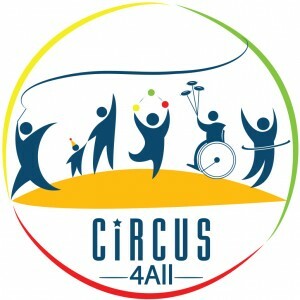 December 3, 2015 – A performance by Circus4All to celebrate the UN International Day of Persons with Disabilities. 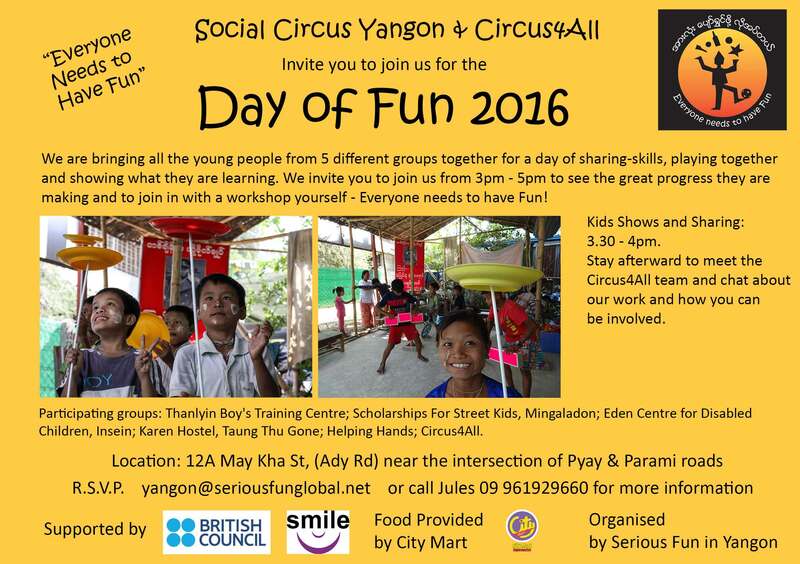 February 13, 2016 – Day of Fun workshops and presentations bringing the Yangon circus teams together for the first time. April 2, 2016 – International Social Circus day event. Public workshops and demonstration. Thanks to all the people who are supporting the project. Visit the Get Involved page if you would like to help make this happen. Social circus groups have developed in many countries over the past 10 years. Well-established groups in the region include Red Nose Foundation (Indonesia) and Phare Ponleu Selpak (Cambodia), whose young teams amazed crowds with their inspiring performances during the juggling festival in Yangon. The world-renowned Cirque du Soleil has developed a social circus arm, Cirque du Monde, which supports and encourages social circus activities internationally. 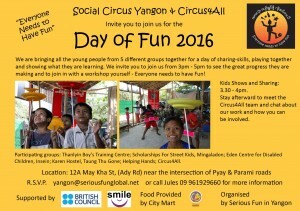 Serious Fun Yangon is taking part in global activities for Social Circus Day on April 2.